Incoming president Rodrigo "Rody" Roa Duterte, popularly known as Digong, has been a wellspring of remarkable quotes and click bait ever since he decided to run for the government's highest position. Dubbed as "The Punisher" and “Dirty Harry of Davao”, his advocacy and campaign platform paved its way to make him the top pick among voters. Being feared especially by his constituents because of his ironclad leadership as he aggressively fight drug trafficking and crime. Behind this tough-talking mayor is a man of wit who doesn't leave interviews and press conference without cracking jokes. These lines have been controversial and made rounds on social media sites and headlines among newspapers. in order to protect the lives and well-being of the many who are good"
if only to save this country from being fractured"
"Just like Marlon Brando, I did it because it was my job. that was what the people expected me to do." "I don't have the brilliance of Marcos, the smartness of Ramos, or the eloquence of Miriam. 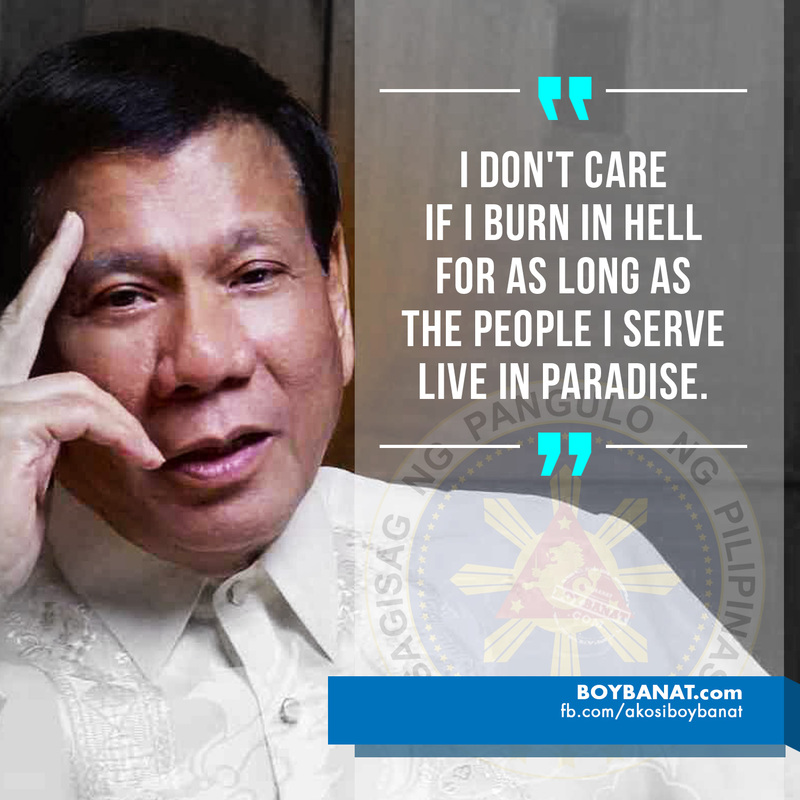 All that I can offer the Filipino people is a good heart and common sense. Governance after all is just pure common sense." the people I serve live in paradise"
because of jostling to get a ride." act too slow, and do too little, don't we? but more good men in public service."